Classical music's had more than its share of broken hearts — but not every composer was lovelorn! Here are six who found lasting happiness in committed relationships. When Schumann's mother heard virtuoso pianist Clara Wieck perform a series of difficult variations, she went up to the soloist and said, "You must marry my Robert some day." 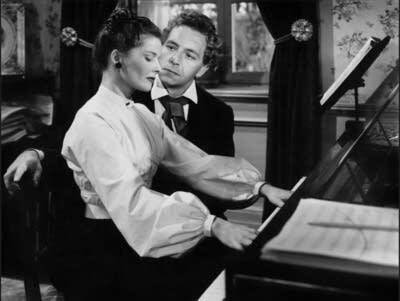 Unfortunately, Clara's father wasn't so thrilled with the idea — despite the fact that Robert was one of Friedrich Wieck's piano students. Under the law of the time, Robert and Clara had to go to court to win the right to marry against Friedrich's objections. After all that, though, the marriage was a happy one: the two remained personal and musical bedfellows until Robert's premature death at age 46, with both composing pieces that have entered the standard repertoire. Another composer who found personal and musical companionship with a single beloved was Benjamin Britten. Tenor Peter Pears was inspiring Britten's music before the two became a romantic item, but from their 20s until Britten's death, they were close personal and professional partners. Britten composed many song cycles for Pears, and the two co-founded a festival and a school. While the number of children birthed is hardly a reliable indicator of marital happiness, it must be observed that Bach and his wife Maria Barbara Bach had seven. (It also must be observed that the great composer and Ringo Starr had this in common: they married women named Barbara Bach.) Unfortunately only four of the Bachs' children survived, but what children! They all had musical talent, especially C.P.E., who became a leading composer of the classical era. Mozart ultimately achieved passionate love with his wife Constanze, but it was initially rocky: Mozart initially fell for Constanze's older sister Aloysia, only turning to Constanze after Aloysia rejected him. Once Mozart and Constanze started courting, they temporarily broke up when Constanze scandalously, as part of a parlor game, allowed another man to measure her calves. In the end, they were happily united, with the composer sending his wife infatuated letters whenever they had to part. Avant-garde composer John Cage was another artist who found a kindred spirit to share his life: Merce Cunningham, the most influential choreographer of the 20th century. Although Cunningham was known for dances that allowed music to be composed separately, he and Cage were in lockstep when it came to shared ideals and artistic adventure. The two were close collaborators and lovers for decades, although they weren't open about their personal relationship until 1989 — when, asked about it unexpectedly, Cage responded, "I do the cooking, and Merce does the dishes."